The power of the internet to both disrupt and revolutionize is perhaps clearest in the field of journalism. The role of everyday citizens in bringing fresh perspectives to events has become more common—and essential. During the aftermath of Hurricane Katrina, individual bloggers were identified as key resources as events unfolded. With the recent violence in Charlottesville, Va., these citizen efforts are showing signs of deep commitment, broad-based networking, and long-term resilience. The tools of broadcast media have gone from owning paper mills, presses, million-dollar transmitters and broadcast licenses, to having a cheap PC or a mobile phone in one’s pocket. That gives everyone the ability to have a direct rapport with the news as either a consumer or a producer, instantaneously. This is like the advent of literacy: it threatened elites and sometimes created problems. But it empowered individuals and led to a far better world. The new literacy from digital media will do the same, even as it creates new problems. Ultimately, I believe it is a positive thing for journalism, because it enables something journalism has lacked: competition from the very public we serve. In a move that he calls “a victory for non-profit journalism and a reminder that public service remains the highest calling of a free press,” Curt Guyette, investigative reporter for the ACLU of Michigan, was given the Michigan Journalist of the Year award by the Michigan Press Association for his dogged work to uncover the toxic contamination of the water supply of Flint, Mich.—a story that was largely ignored by the traditional press and was denied for 2 years by government officials who continued to assert that the Flint water system was safe. A recap: The rally in Charlottesville on Aug. 12 protesting the removal of Confederate monuments drew a large number of counter-protesters. Tensions rose, and in connection with the melee that followed, one counter-protester and two police officers were killed, and 19 others were injured. The openness of the participating hate groups in their choice of dress, chanting, and signs further ignited counter-protesters and bloggers. Pictures, videos, and reports were being instantly uploaded to Twitter and other social media sites for a global audience. Democratic governor Terry McAuliffe declared a state of emergency, saying at a news conference that he had a message for “all the white supremacists and the Nazis who came into Charlottesville today: Go home. You are not wanted in this great commonwealth.” The president’s comments about the event were seen by many as providing less-than-clear moral leadership: “We’re closely following the terrible events unfolding in Charlottesville, Virginia. We condemn in the strongest possible terms this egregious display of hatred, bigotry, and violence on many sides, on many sides.” Rather than calming the situation, his comments seemed to only heighten the anger and frustration. 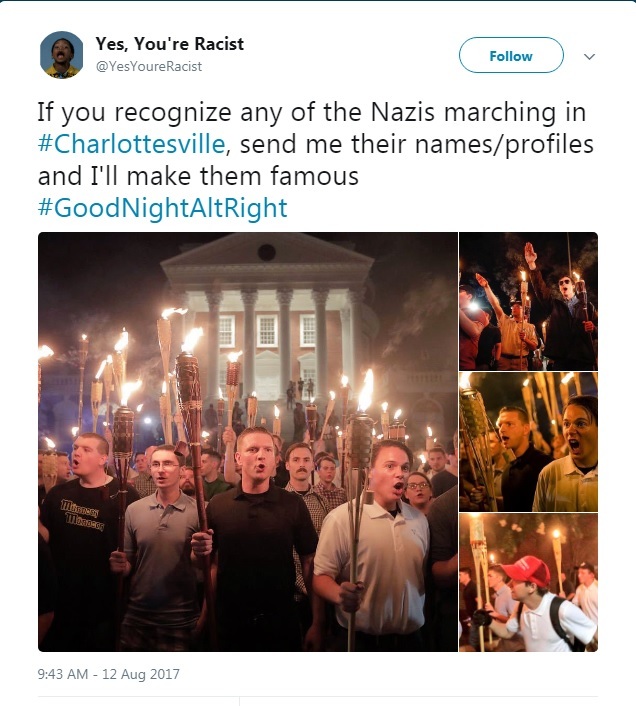 As NPR reported in the aftermath, these protesters “didn’t wear hoods as they chanted ‘Jews will not replace us.’ They weren’t hiding their faces as they waved Confederate flags, racist signs and swastikas. They looked straight at a sea of cameras as they made the Nazi salute.” This meant that their pictures could be taken and posted online, and many began to request that people help identify the protesters in the pictures. In short order, the Twitter account Yes, You’re Racist and hundreds of other social media sites included photos or short videos from the scene. The ACLU of Virginia released a video showing a man, later identified as Richard Preston, firing a gun near a crowd after yelling a racial slur. Toler says, “There are a number of unresolved questions from the rally, including the identities of some of the most violent individuals. With nearly everyone at the rally having a cell phone, there are likely hundreds of videos online showing the events of August 12. 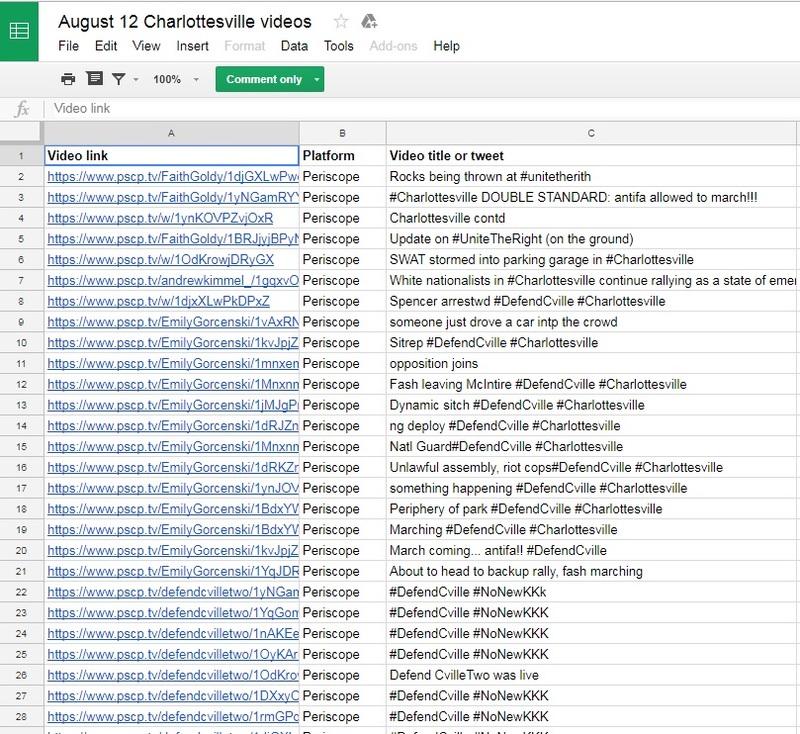 We have attempted to catalog these videos into a spreadsheet on Google Docs, providing a publicly accessible area for our readers to find and even contribute materials showing the events of August 12.” Librarians and academics have long known the importance of archiving information, and having this as a key goal for such a broad-based project is good news. Today, technology is giving everyone a platform—but it doesn’t give anyone a free ride. The actions of these citizen journalists and bloggers represent a new twist to activism and reporting, but technology also provides a new role for all citizens as part of the fourth estate—journalists—which provides the balance that our Founding Fathers built into the very fiber of our democracy with the First Amendment.